FRAMECAD® Viewer is an Android application to visualise FRAMECAD® Structure files on your device. FRAMECAD® Structure is a comprehensive and powerful detailing and design software package with advanced computer-aided engineering capability, it makes real time engineering calculations as the designs are created, analysing loads, deflections and other forces, making it an easy process to check for compliant engineering. 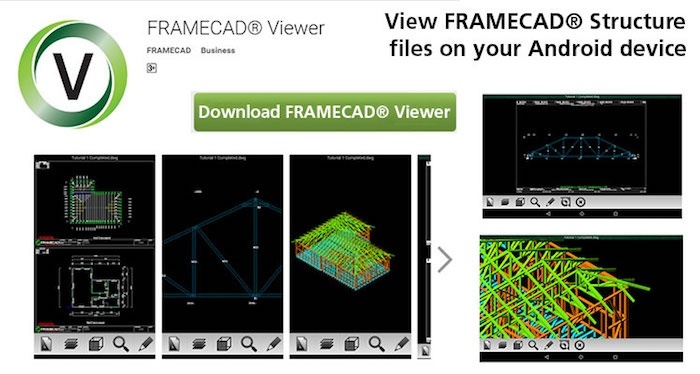 FRAMECAD® Viewer enables you to visualise your FRAMECAD® Structure files on your android device. You will be able to view the files anywhere, with an easy transfer and communication to your team onsite. What can you do with FRAMECAD® Viewer ? Type FRAMECAD in the search menu or use the following link here.